Go a little wild with our Frosted Plastic Zebra Print Shopping bags! Designed to enhance the charm in your store, customers will love taking their apparel, accessories, and other general merchandise home in these shopping bags. Incorporate tissue paper, ribbon, or raffia to transform ordinary plastic shopping bags into beautiful gift bags! 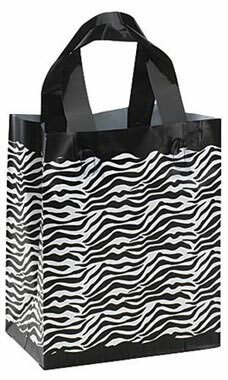 As a popular choice for many retailers, especially boutiques and specialty shops, these zebra print bags are made of high density plastic and feature loop handles and a cardboard bottom insert for easy transport. Sold in cases of 25.